Hublot CEO, Ricardo Guadalupe first announced Shepard Fairey as part of the Hublot family, and together they unveiled the new Big Bang Shepard Fairey at the historic Mack Sennett Studios in the East LA neighborhood of Silver Lake, and celebrated with VIPs, media, influencers, and friends of the brand. Notable attendees included rock band Franz Ferdinand, comedian Joel McHale, artist LOVE WATTS, Spanish artist Okuda, curator of street art exhibition “Beyond The Streets” Roger Gastman, actor Duane McLaughlin, singer Petite Meller, and more. Throughout the evening, guests enjoyed street food, festive cocktails, and interactive entertainment including a live DJ set by Shepard Fairey himself! The location, founded in 1916, is one of the oldest surviving film studios in Los Angeles and the site of many early movies. 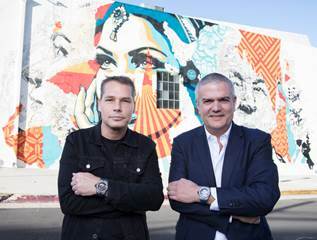 The façade features a huge mural entitled, “American Dreamers” which was painted by Shepard Fairey and fellow artist Vhils in February 2018. 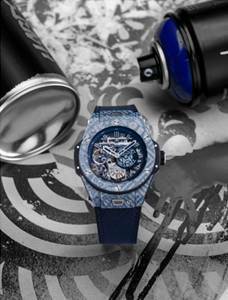 Developed over a span of two years, its manually-wound skeleton calibre, with a 10-day power reserve, contains 223 parts. A testament to beauty and technical expertise, it has two barrels parallel to the power reserve indicator: a cogwheel system with two rakes sliding along a horizontal axis. 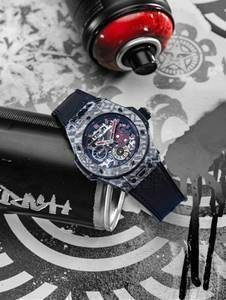 Accentuating this mechanical architecture, an opening at 3 o’clock sees Shepard Fairey’s “STAR GEAR” logo and unveils a red dot when the movement is nearing the final days of its power reserve, while a gearwheel at 6 o’clock indicates the exact number of days remaining and the regulating organ, coupled with the small second regulator, appears at 7 o’clock.